What Exactly IS an HEIRLOOM? It’s true, each variety has its own characteristics and personality, but across the board there are a few rules to follow that will ultimately lead you to the best tasting tomatoes. Look for fruit that has a fresh calyx. This is the cute little green star shaped hat on the top of the tomato beneath the stem. If the calyx is bright green, supple and sticky, this is a tomato that was recently harvested. As a tomato ages, the calyx will dry out and become brittle, eventually falling off. Get in touch with what you like in a tomato. Think about texture, consistency, color and flavor, and what you want to do with your tomatoes. Are you canning, saucing, slicing or dicing? Super ripe tomatoes are ideal for sauces, while firmer tomatoes will hold up on a sandwich or in a salad. More than 20 years ago, Happy Boy Founder Greg Beccio planted his first row of Heirloom Tomatoes. Since then, we have grown more sophisticated in selecting, production, handling, and sales of this crop, which is the undeniable pride and joy of the farm. 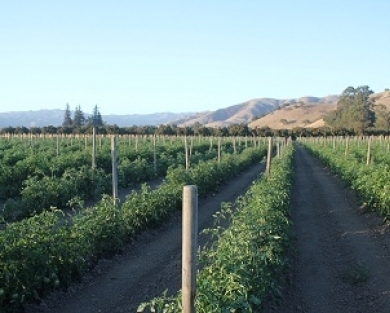 Happy Boy Farms is well seasoned in tomato farming and our multiple decades of experience are among the keys to growing the best tasting tomatoes possible. After narrowing our sights on optimal varieties for our soil and microclimates, each season we trial some different heirlooms and stick by some of our all-time favorites, relying heavily on our own saved seeds. The process is painstaking, but worth the effort, as it ensures quality and maintains the consistency of our varieties. Our best performing tomatoes are seeded by hand, starting out in our own greenhouses at Old Chittenden Road in San Jaun Batista, and then are transplanted into the prepared fields at our Chowchilla Ranch (just east of Los Banos) in the early months of Spring. Here, we usually experiences warmer days than at our more coastal fields, which can allow us a head start on the season. 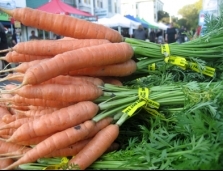 In addition, the sandy soil can be easier to work in the wetter months, enabling us to have some spring and summer crops quite early. With inclement weather in the late winter and spring always a possibility, these initial plantings can be risky, but with favorable conditions we sometimes have ripe tomatoes by mid-May. No matter what the weather has in store for us, our entire production is done with incredible care, by hand. From the greenhouse to transplant, it’s done seed by seed, plant by plant. Each and every tomato plant is field-grown, in the sun, and most importantly, hand-harvested at a ripe stage, with absolutely no hothouses, hoop houses or climate controlled assistance. We stagger plantings based on the particular climates of our fields, so just as our central valley production starts to wane the successive plantings in our Pacheco Pass fields start to ripen and come on strong. This kind of planning means Heirlooms can be enjoyed all summer long and well into October, sometimes even a bit later. With good weather and a late first frost, we have even harvested our tomatoes as late as Thanksgiving. That’s expertise, plus plenty of luck. 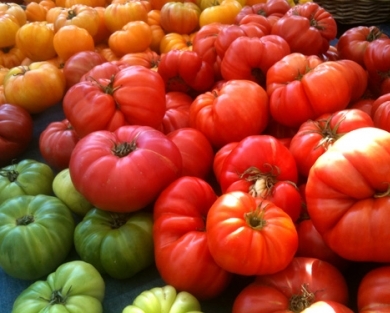 Our tomatoes have a multitude of flavors, ranging from very acidic to very sweet with many degrees in between. Many people think that tomatoes only come in one or two colors. To their surprise, tomatoes come in a multitude of colors with red being the most common in this country. Other colors are pink, brown, black, orange, purple, white, green (even when ripe), and various striped varieties including the red-striped Yellow German variety. And all of the above colors come in varying hues and shades. Most people are also surprised to discover that our tomatoes can have so many shapes: oblong, flat with ribs, heart-shaped, ruffled, pepper-like (and hollow just like peppers), and many other unique silhouettes. While most plant breeders have tried to make them rounder and more uniform - or even square for easier boxing and shipping - we value the plethora of shapes our different varieites naturally produce. It’s wise to select fruit in several stages of ripeness so that you can have a supply for the week. If you select fruit that is ready on the day of purchase, some may over-ripen by the time you are ready to eat it. Many people prefer a slightly firmer tomato, fearing that anything too ripe will have poor texture and flavor. 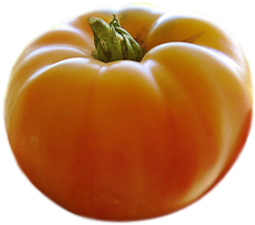 With Happy Boy Heirlooms, this isn’t usually the case and a tomato that has some give under the pressure of your fingers can actually be the perfect juicy, flavorful and silky smooth tomato you hope it to be. 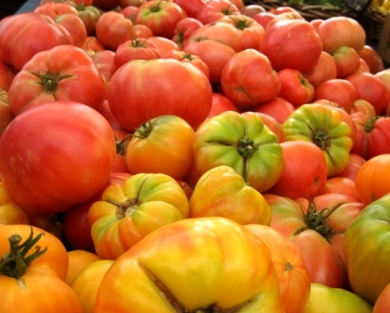 Heirloom tomatoes have thinner skin and because of this they can seem too ripe. There is a fine line between perfectly ripe and too soft, but because the quality of the heirloom tomatoes we grow is so high, even a very ripe piece of fruit can still have knock-out texture and flavor. People who care the most about tomato flavor tend to lean toward the thin-skin, softer varieties and know just when to serve them, based more on how they feel to the touch rather than how they look to the eye. The sky is the limit with our numerous heirloom tomatoes. They are great raw, sliced on burgers or with basil and fresh mozzarella, diced into salads with a balsamic vinaigrette and cucumbers or salsas with lemon, onion, pepper and cilantro, awesome in sauces, roasted with garlic and marjoram, halved and broiled with olive oil for quick pastas or even blended for gazpacho or bloody marys. Tomatoes are also easy to can and enjoy year-round. Some chefs also combine tomatoes with watermelon for a freshingly sweet-tart summer salad or drink.